I'm a huge fan of making bread these days, but it hasn't always been that way! Not too many years ago I was terrified of using yeast. It just seemed all too hard and that there was so much that could go wrong. My first step to making homemade bread was with a breadmaker and bread mix. All the hard work was done for us, there was no kneading, no shaping and no worrying about getting the oven temperature right. Plus I loved the convenience of being able to set it the night before and wake up to fresh bread first thing in the morning. Is there anything better than the smell of fresh bread?? We then moved on to just mixing and kneading the dough in the breadmaker but shaping and baking the dough ourselves. This meant we could make proper sandwich loaves and cob loaves rather than just the squat oblongs you can make in a breadmaker. After lots of use our breadmaker finally gave up and died and we went back to buying supermarket and bakery bread, which was not ideal for a number of reasons - it's more expensive, it's not as fresh, and there are lots of questionable ingredients like preservatives, emulsifiers and vegetable oils to name a few. But before we could fully commit to making all our own bread from scratch we took one important step - we cut back on the amount of bread we were eating. I've dabbled with a Paleo style of eating and while going completely grain free is never going to work for my family, reducing grains (and especially wheat) can only be a positive step for our health. I now make just 1 loaf of spelt and grain sandwich bread every week and that does sandwiches and toast for all of us for the week. I often also make one other type of bread, such as cheese and olive scrolls for lunchboxes or a focaccia to have with soup. A few weeks ago we had friends around for breakfast and wanted to serve some fresh bread. I could have made an extra loaf the day before but it wouldn't have been as fresh, and as it was a public holiday there was no chance of nipping down to the bakery and grabbing a loaf that morning. 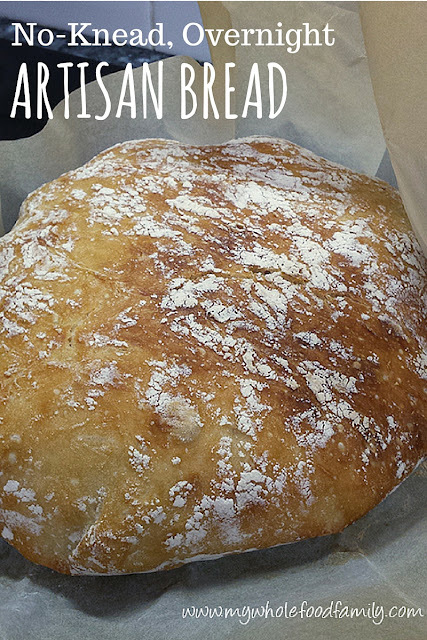 So I went searching and came across a basic recipe for a no knead, overnight artisan bread. This recipe seemed to pop up everywhere! With that many reviews I knew it had to be good and it was just what we were looking for. If you're a novice bread-baker this recipe could be just the thing to help you fall in love with baking bread. Why? Just mix, rest and bake. Easy! 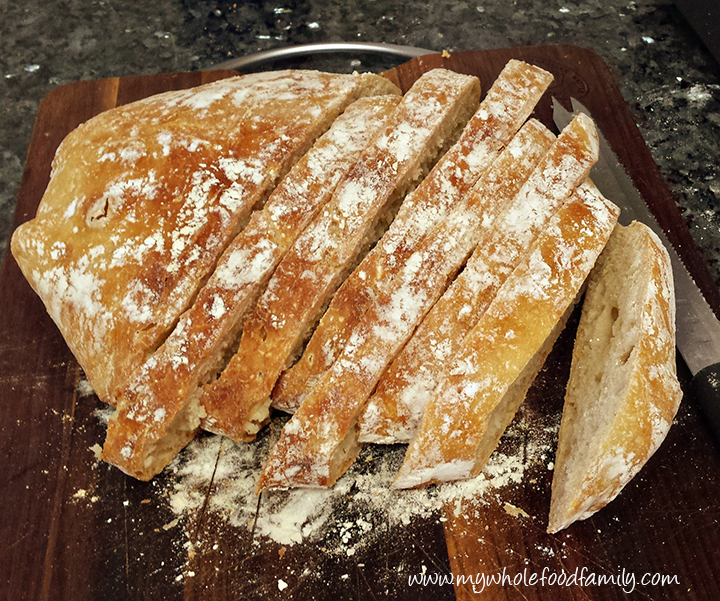 This made a fantastic loaf of bread - crackly crusty exterior with a chewy texture reminiscent of sourdough. Totally delicious and perfect for our breakfast of eggs, bacon, grilled tomatoes and homemade tomato sauce. Yum! Stir together the flour, salt and yeast in a large bowl. Pour in the water and mix well to form a rough and shaggy dough (it will not be smooth). Cover with plastic wrap and leave on the bench for 8-18 hours, or just overnight. It will be light and bubbly. When you are ready to bake, flour your hands and a sheet of baking paper and tip out the dough. Gently shape into a ball, without kneading, and leave on the baking paper covered with a tea towel for one hour. When the dough has rested for 30 minutes, place a large heavy oven-safe pot (like a Dutch oven) into the oven and preheat to 230 degrees Celsius. After the dough has rested for an hour, remove the pot from the oven and carefully place the dough inside, still on the baking paper. Put the lid on the pot and place back into the oven to bake for 30 minutes. Remove the lid and then bake for a further 15 minutes. Remove from the oven and place on a rack to cool completely for at least 30 minutes before slicing.